Winter Storm Toby will become the fourth nor’easter in less than three weeks to impact the East Coast and has the potential to be one of the heaviest snowstorms this late in the season along parts of the Interstate 95 corridor, including in New York City and Philadelphia. As they did with recent storms, airports and airlines are already cancelling flights and offering to waive change fees in light of the impending storm. Amtrak has also cancelled many routes for Wednesday (see below). More than 320 flights were cancelled in the United States as of Tuesday morning, with around 340 delays, according to FlightAware, a website that tracks flights around the country and world. Philadelphia International Airport cancelled 69 flights by Tuesday morning — 13% of its scheduled flights — and Reagan National Airport in Washington, D.C., and Baltimore/Washington International Airport cancelled 8% and 10% of their flights, respectively. 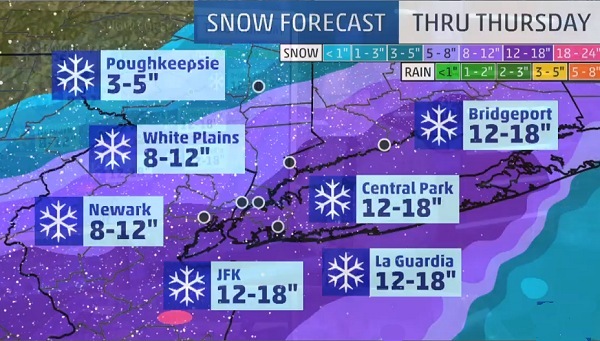 It’s possible more flights will be cancelled as the storm heads for the East Coast late Tuesday into Wednesday. American Airlines is offering to waive change fees for passengers scheduled to travel to, from or through a number of East Coast states, including New York, Maryland, Washington, D.C., and Rhode Island, among others, from March 20-21. Passengers can re-schedule flights to depart anytime from March 18 through March 25 for free, so long as they do not change their origin or destination. This time around, Delta is using its winter weather waiver to eliminate change fees for passengers traveling to, from or through East Coast states between March 20-21. Customers hoping to change their flights for free must schedule them to depart on or before March 25 to avoid fees. United Airlines is waiving fees for passengers changing their flights scheduled to take off between March 20-21 from, to or through Maryland, Massachusetts, Connecticut, Pennsylvania, New York, Maine, Rhode Island and Washington, D.C. Passengers must rebook their flights to take off on or before March 24 to avoid any fees. Southwest Airlines sent out warnings that its flights taking off from, to, or through airports in Baltimore, Philadelphia, Pittsburgh, Washington, D.C., New York and Boston, among others, could be delayed, diverted or cancelled due to the storm. Customers looking to change their flights scheduled to depart March 20-22 can do so without paying a fee as long as the new flights take off within 14 days of the original travel date. Passengers scheduled to take off, or travel to or through, Baltimore, Boston, New York, Philadelphia, Washington, D.C., or Newark, N.J. on Alaska Airlines from March 20-22 can rebook their tickets for flights departing on or before March 28 without getting a change fee. Spirit Airlines customers scheduled to travel to, from or through Atlantic City, Baltimore, New York, Philadelphia, Pittsburgh, or Newark, N.J., from March 20-21 can change their flights to depart on or before March 24 without a fee. Passengers on flights heading from, to, or through Boston and Hartford, Conn., on March 21 can reschedule flights for free to depart on or before March 24 as well. Passengers heading to, from or through airports in New York, Philadelphia, Washington, D.C., Providence, R.I., and Trenton, N.J. on March 20-21 with Frontier Airlines can change their flights with no fees so long as the flight is scheduled to depart on or before March 30. Amtrak will operate a modified service on Wednesday, March 21, due to inclement weather. Full scheduled service will be restored pending improved conditions. Palmetto Service (New York – Miami): 89 will not operate between Washington, D.C. and Savannah, Ga.
Downeaster (Boston – Portland – Brunswick) and Amtrak Shuttle Service (New Haven, Conn., and Springfield, Mass.,) will continue to operate as scheduled. Customers will be re-accommodated on trains with similar departure times so please check on Amtrak.com or your smartphone app. For customers looking to change reservations for travel during the modified schedule, Amtrak will waive the change fee (customers must contact the reservation center at 1-800-USA-RAIL). Anyone planning to travel should check their train status prior to departing, allow extra time to get to the station and be extremely careful in stations and on platforms. Amtrak is actively monitoring the winter storm and has positioned engineering crews and locomotives at strategic locations along the corridor to proactively remove limbs and branches that are close to the right of way.